While auto shows are fun we always find them a tad bit disappointing because only a small percentage of what we see on the floor will make it to production. So our response to the debut of the Hyuundai HCD-14 Genesis Concept at the Detroit Auto Show is an odd mix of elation and frustration. I mean, we LIKE the suicide doors, you know? But there’s much about the HCD-14 Genesis that may actually wind up on the lot. Autoblog.com says those possibilities include new technology that reads the driver’s eye and hand movements (!! ), along with “improved driving dynamics with a more rigid chassis, new driver-selectable settings for various driving conditions and, of course… the 5.0-liter direct-injected V8 paired to an eight-speed automatic transmission.” Okay, we’ll hold off on being bummed out. 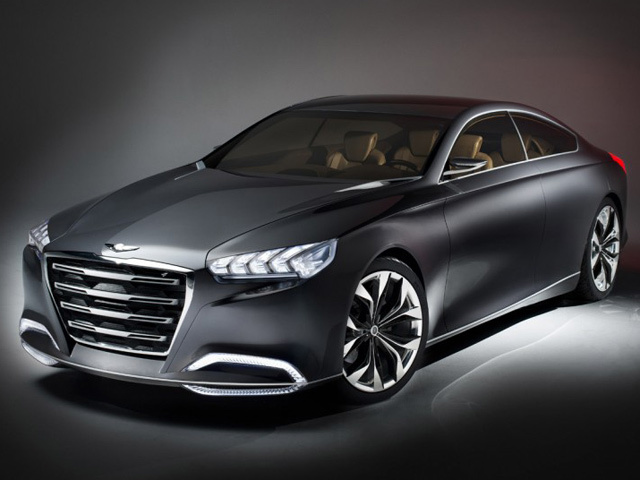 For more on the Hyundai HCD-14 Genesis Concept click here. ← Previous Post Save the Monopoly Racecar!